Volkswagen is a major global car company which has several brands in its portfolio including luxury brands like Audi. Even after the diesel scandal of 2015, VW has made a strong return in 2016 and 17. There are several reasons behind the strong position of the brand in the market including its strong financial position as well as brand image and a large product portfolio. Apart from being a market leading brand, VW has a large product portfolio that includes both passenger cars and luxury vehicles. Both Audi and Skoda are popular brands that have achieved an excellent position in the market and have been highly popular in the Asian markets. The VW group includes two divisions – automotive and financial services. In 2017, it achieved a new vehicles sales record even amid a highly competitive and challenging situation. However, the issues arising from the diesel engine scandal continued to affect its operating profits. 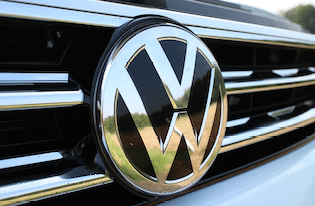 Had it not been for the strong market position of Volkswagen, the effects of the scandal would have been stronger which cost the brand billions in fines. The car brand set a new sales record of 10.8 Million vehicles in 2017 and achieved sales revenue of 230.7 Billion Euros which was 6.2% higher than the previous year. In North America demand grew higher in US and Canada driving the total sales figure to 1 million vehicles in the region. The Asia Pacific region saw its sales rising to 4.5 million vehicles from 4.4 million vehicles in the previous year. Apart from Audi and Skoda, VW’s portfolio also includes Bentley, Porsche and Ducati brands. Its automotive division produces and sells passenger cars, light commercial vehicles, trucks, buses and motorcycles, as well as genuine parts, large-bore diesel engines, turbo-machinery, special gear units, propulsion components and testing systems businesses. This is a list of the main competitors of Volkswagen Automobiles. Major names among VW’s competitors include – Ford, General Motors, Toyota, Suzuki, Hyundai, Nissan, Honda, FCA (Fiat Chrysler Automobiles), BMW & Mercedez. Ford is among the most famous car brands of the world. The company was incorporated in Delaware in 1919. Ford Motors came into formation through the acquisition of Ford Motor Company that made and sold vehicles engineered by Henry Ford. Today, Ford Motors Company is a global brand that designs, manufactures, markets, sells and services a large range of vehicles including Cars, trucks, SUVs, electrical vehicles and Lincoln Luxury vehicles. Apart from these, the brand also provides financial services through Ford Motor Credit Company LLC. The company is consistently working to grab a leadership position in mobility and electrical vehicles. Its main two business segments are automotive business segment and financial business segment. The other business segments of Ford Motor Company include Ford Smart Mobility LLC and Central Treasury Operations. The vehicle brands of Ford Motor Company include Ford and Lincoln. In 2017, the brand sold around 6,607,000 vehicles at wholesale. Ford is an innovative brand and also one of the most popular brands in the Asian markets. In 2017, it sold more than 2.5 million vehicles at retail in US. The number of Ford trucks (retail sales) sold in US equalled 1,123,416 units whereas it sold 867,909 SUVs and 595,390 cars during the same period. Toyota is a major global vehicle brand and a tough competitor for Ford, Hyundai & Volkswagen. The brand is a globally well known manufacturer of cars, SUVs and electrical vehicles. Its focus is now on sustainable growth and the production of electrical vehicles that have a very low impact on the environment. North America is the largest market for Toyota, followed by Japan and Asia. In 2017, North America accounted for the highest of Toyota’s sales at 32% of the total 8,970,860 total sales. Toyota has 364,445 employees. Its number of manufacturing plants and companies around the world was 69 in 2017. In 2017, its net revenue was 27,597.1 Billion Japanese yen which was 2.8% lower than the previous year. The brand’s net income in 2017 equalled 1831.1 Billion Japanese yen. Toyota brought the world’s first mass produced hybrid vehicle Toyota Prius in 1997. It plans to invest more in the production of electrical vehicles and bring new and improved versions of Prius. It has brought some luxury models to the market too including Camry which is now available in a hybrid version. Hyundai is also a major global car brand whose popularity in the Asian markets is high. Apart from passenger cars and SUVs, Hyundai also brings luxury vehicles and owns the Kia brand. Its technology and brand image are important factors behind its popularity. It has brought several market leading cars in the small car segment in Asian markets. It is a leading brand in several other areas too including owning the largest manufacturing plant. Its Ulsan plant in South Korea is the single largest automobile manufacturing plant in the world. Hyundai has manufacturing plants in US, Brazil, Russia, China and India. Apart from the passenger cars, small family cars and SUVs, the brand also makes MPVs, eco friendly cars and the Genesis brand cars. Elantra, Sonata, Santa Fe, Tucson and Creta to IONIQ, Hyundai sells a very large range of highly popular vehicles. Hyundai’s largest market is Asia where it sold more than 1.88 million vehicles in 2017. The brand achieved a revenue of 96376 Billion Korean Won from the sales of 4.9 Million vehicles in 2017. Hyundai is also one of the tough contenders in the global automotive market and a major competitor of Ford Motors whose position in the Asian markets continues to grow stronger. Suzuki is also a renowned brand of automobiles and motorcycles. Apart from them, the brand also produces marine vehicles. Japan is the home market of Suzuki. However, India is its largest market. In 2017, the brand sold more than 1.4 million vehicles in India. In Japan, it sold around 639,000 units. India and China have grown to become important markets for the passenger and small car brands. It is why Suzuki is among the major competitors of Ford in India. Apart from a slight increase in the sales of Suzuki motorcycles in 2017 in Japan, their overseas sales fell in early all markets including North America and China. Net sales of the brand fell from 3180.6 Billion Yen in 2016 to 3169.5 Billion Yen. Nissan is also a major global car brand. North America and China are its biggest markets. The brand achieved sales of 5.6 million vehicles in 2016 and expected to achieve the sales of 5.8 million vehicles in 2017. In 2016, its net sales in North America totalled 2.1 million vehicles whereas that in China reached 1.35 million vehicles. In 2016, its net revenue declined by 3.9% to 11.72 trillion Yen. Some of the SUVs made by Nissan have bene highly popular in the Asian markets. The brand is also working on releasing electric cars and on making its foray into automated driving. BMW is another major global brand of luxury cars and motorcycles that saw its sales and market share climbing in 2017. It owns BMW, Mini and Rolls Royce brands. 2017 was an year of growth for the brand and China was the main driver of growth. Its core brand BMW sold more than 2 million vehicles in 2017. The automotive market has grown highly competitive and despite that BMW managed to grow its sales by around 4 percent to 2.46 million vehicles overall. In Mainland China, the total deliveries made by BMW rose past 590,000 whereas in Americas and US there was a slight decline in overall sales. In 2017, it achieved an important milestone of having sold its 100,000th electrical vehicle and is planning to move faster ahead in the direction of electrification. Its continuously improving position in the Asian markets can be a challenge for the other vehicle brands.